﻿ So here comes Mayday Parade rolling into town again as they do every couple of years or so in what has proven to be one of, if not the most prolific touring machine in modern pop-punk. Except this time the stakes are a bit different, celebrating the tenth anniversary of their seminal debut A Lesson In Romantics with a front-to-back run-through that at least makes this a bit more worthwhile than their regular runs. 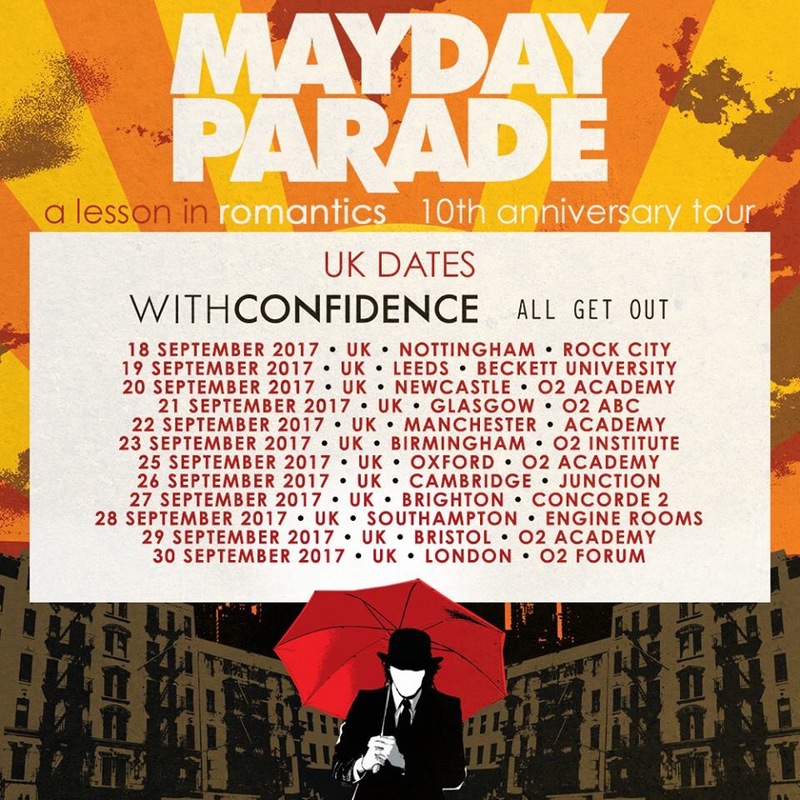 But given how Mayday Parade have been improving with each passing tour, this could potentially be their big moment to shine. Their thunder certainly isn’t in any danger from All Get Out (5), who deal out your basic, garden variety emo that’s serviceable but offers nothing that literally hundreds of openers haven’t done in the past. Alongside a penchant for being far too slow and lumpen for their own good and a muddy mix that does them no favour whatsoever, All Get Out don’t exactly give an already nonplussed crowd much to work with. At least With Confidence (7) bring an energy that’s definitely appreciated. It’s actually surprising how well what they do here works; they don’t draw from much else besides pop-rock’s relatively small pool of tricks, but with the boyishness of fellow Aussies 5 Seconds Of Summer on their side, there’s an impression made here that’s sizable enough. Launching into a sugary, vibrant Voldemort doesn’t exactly hurt, and with a fair bit of charisma on frontman Jayden Seeley’s part and a much-improved mix, this might be pop-rock-by-numbers but its impressively well-formed nonetheless. Archers and Keeper are irrepressibly infectious, and even drawing on older cuts like Godzilla proves surprisingly successful from a crowd that has filled up considerably by this point. Again, nothing groundbreaking to be found here, but if With Confidence can build on this already present promise again like this, they could be worth keeping an eye on. The same could also be said about Mayday Parade (8) in fact. They aren’t exactly anything special as a live band, but they’ve always got an energy and charm to them plasters over a lot of those cracks. Nostalgia might also factor into that, especially now, and especially given a crowd who seem a bit older than average. Though given that there’s barely a weak link among A Lesson In Romantics‘ tracklist and that Mayday Parade seem more relaxed and fired-up than they have done in a long time, there’s a lot to like about this. For a start, they don’t miss a beat throughout, even on the tracks that have been boxed away for a good few years; Alex Garcia pulls off the sweeping solo on I’d Hate To Be You When People Find Out What This Song Is About note perfectly; there’s a freshness to Ocean And Atlantic and Champagne’s For Celebrating (I’ll Have A Martini) that’s a good look for Mayday Parade; and the recently retired When I Get Home, You’re So Dead is back with a vengeance and is done amazingly well all the same. What’s even more surprising is that, even though these are cuts that don’t often find themselves in the set, if anything, they’re even better than the regulars. That’s not to say they fall short though; Mayday Parade really do hit a stride here that’s only hampered by the latent commonality of their more popular tracks, even though it’s nigh on impossible to say they aren’t executed well. Jamie All Over and Black Cat have hit a gold standard within pop-punk now that makes their one-two opening all the sweeter, and as is tradition, Derek Sanders taking to the piano for Miserable At Best has all those mid-2000s hearts in a stranglehold once again. No, where Mayday Parade do take a noticeable stumble is in their post-album mini-set which, not only feels tacked on as it is, but doesn’t carry as much of a weight of purpose as what preceded it. For a start, Sanders solo acoustic cover of Something Corporate’s Punk Rock Princess flies over way too many heads, and ditching the piano for a similarly acoustic Terrible Things feels like a bit of misstep when it comes out rougher and less dramatic than it reasonably should. To be fair, Three Cheers For Five Years and especially a mountainous Oh Well, Oh Well do pick things up, but what could’ve been a near spotless set for Mayday Parade – something they’ve never actually achieved before – ends up feeling scuppered on the home stretch. But even so, this is perhaps the best Mayday Parade have sounded in a long time. Not only does this feel like a band galvanised between themselves, but with this sort of airing of rare material, this actually feels like an event rather than the semi-regular tours that probably everyone in the room has seen before. When that’ll happen again remains to be seen, but embracing their past has put Mayday Parade on the best possible course for the future, and who thought that would ever happen again?